Oswald George Nelson was already a successful bandleader when, in 1932, he signed an up and coming singer to join his act. Her name was Harriet Hilliard, and though they wouldn’t have believed it at the time, they were to become the patriarchs of one of America’s most beloved families. 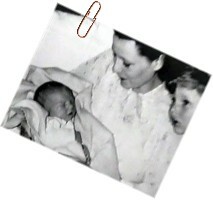 Having married on October 8th 1935, they were soon welcoming the arrival of their first born, David, a year later on October 24th 1936. Then on May 8th 1940, Eric Hilliard Nelson was born at the Holy Name Hospital in Teaneck, New Jersey. 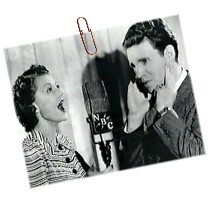 The Nelsons place in history was confirmed when on October 8th 1944 they began work on a radio show which was to become the longest running sit-com in U.S. history: The Adventures Of Ozzie & Harriet. After a few episodes it was decided that the show would benefit from the introduction of the couples children, David and Ricky. But instead of the actual David and Ricky, actors were hired to portray them. However it didn’t take long for the boys to persuade their dad that they were more than capable of playing themselves on the show. And so, on February 20th 1949, a unique event occurred on air. A family, portraying themselves, with many referances to events in their own lives. It was in many ways, the worlds first reality show, and listeners were hooked. 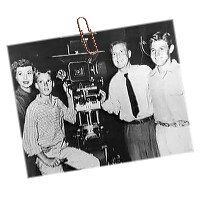 By 1951, Ozzie had in mind a move to televison and began scripting a big screen adaptation which would be a perfect chance to discover how people took to seeing the family for the first time. Here Come The Nelsons was a hit and convinced Ozzie that television was a viable option. 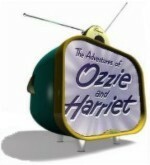 Ever the businessman, Ozzie took on the role of producer, director, head writer and story editor of the show which began filming at General Services Studio in Hollywood for ABC. The first episode entitled, The Rivals, debuted on October 3rd 1953. It was to continue for a further 11 seasons and created the stereotypical image of the family of the ‘50’s that survives to this day. Ricky was 13 by now and had established himself as the “irrepressible Ricky” a wise-cracking kid, who likes nothing more than getting one over on his older, more sensible brother. Off-screen Ricky was developing a keen interest in sports, even joining David in perfecting a dazzling trapeze act, but his pasion lay in tennis, for which he reached the semi-finals of the National Indoor Junior Championships at the age of 16. A near fatal car accident that same year landed him in hospital with a crackled vertebrae, but it was to be something totally different that would lure Ricky away from taking up tennis professionally. Ricky Nelsons entry into the Rock ‘N’ Roll Hall Of Fame, began as a boast to get the attentions of a girl he had taken on a date. Whilst driving her home, she began telling Ricky how wonderful she thought the guy on the radio was, a new singer called Elvis Presley. 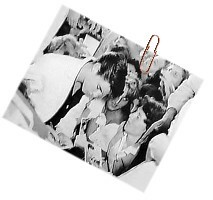 Presley was wowing the kids of America like no one before him with his unique sounds and every girl dreamed after him. Ricky was no fool, and immediately informed the girl that he too was going to release a record. By the time he got home he had decided that this wasn’t such a bad idea and set about persuading his dad of this. Ozzie duly obliged and Ricky recorded a cover of the Fats Domino classic I’m Walkin’ (The only song which he knew in it’s entirety) To promote the record it was decided that Ricky would perform it on an up-coming episode of the show. On 30th April 1957, Ricky The Drummer aired with 16 year old Ricky performing for the first time. A few weeks later teenagers up and down the country were catapulting the single up the charts and Ricky became a Rock ‘N’ Roll star practically overnight. Suddenly the youngest son of America’s favourite family was performing this music, which had long been seen as a bastion of moral evil in homes throughout the states. Ricky was rightly credited with making Rock ‘N’ Roll accessible to millions and changing the opinions of the older generation. After all, if Ozzie & Harriet approved it couldn’t be as dangerous to the youth of America as people had feared. Pretty soon Ricky was making personal appearances world-wide and was signed to the Imperial label with a five year contract. 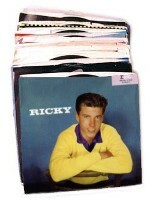 His first full album Ricky was released in October 1957, reaching the no. 1 spot and spawning such top five hits as “Be Bop Baby” and “Stood Up”. 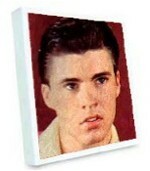 His second album Ricky Nelson garnered Ricky his first no. 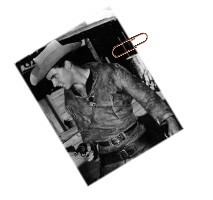 1 single with Poor Little Fool whilst the haunting Lonesome Town, from his third album Ricky Sings Again, showed the world that Ricky Nelson had a quality to his voice that belied his young age. In fact Ricky proved very early on that he was certainly not an Elvis wannabe and that he was in fact a serious recording artist with his own unique sense of style and pacing. Never a hip swiveller, Ricky was able to portray the vitality of his music just standing at a microphone or with his beloved guitar in front of him.